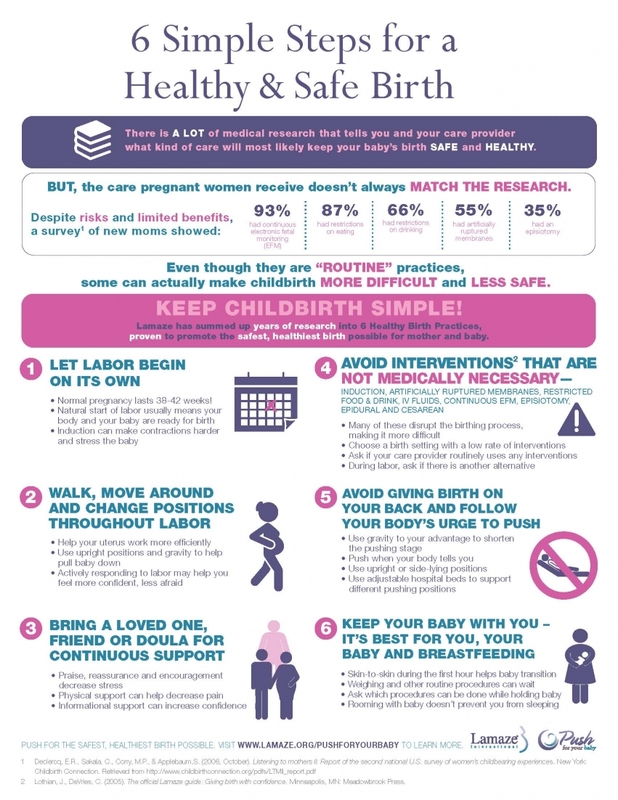 Why should I take a childbirth class? What makes a Lamaze class different than other classes? Why should I take a independent class instead of the childbirth class at my hospital? What types of services should I expect from a birth doula? Do you offer discounts or low cost options? Why choose Birthing Confidence over a doula agency? Childbirth classes are a must for every expecting parent. Not only do childbirth classes explain what to expect during late pregnancy, early labor, birth, and early postpartum, but they also teach you how to manage the pain that usually comes along with labor. They also help you make an informed decision on the type of care you desire, what choices are important to you, and what kinds of medical interventions you'd like to avoid. Also, childbirth classes help your labor support team understand how to best help you during labor and in the postpartum period. Certified Lamaze classes follow the Lamaze Fundamentals of Pregnancy, Birth, and Parenting and teach the six healthy birth practices. Lamaze classes are usually 8-12 hours and cover late pregnancy, birth, and postpartum care. Many childbirth classes follow a set curriculum that is approved by the hospital or certifying organization. However, the research included in these curriculums begins to age and then the information taught is out of date. For instance, the American Academy of Pediatrics (AAP) just announced that there is no suggested age for turning a car seat front facing, that it is instead, based solely on the weight of the child. Because Lamaze doesn't require that I use a particular curriculum, my class information was updated as soon as AAP made the announcement. However, it could be years before the booklets for these different curriculums are updated. Lamaze classes are evidence-based and teachers are responsible for keeping their research and information up-to-date and applicable to the community they are teaching in. I think you should take both. Usually, childbirth classes offered by your hospital are free or low cost. They do a great job at setting expectations for how birth proceeds typically at their location. Taking a class independent of the hospital can help you further understand normal birth, help you identify areas that you may want to talk to your care provider more about, and delve deeper into your specific goals. Instead of concentrating on just one hospital's procedures, an independent class is going to give you a broader perspective of how people birth and the different options available in different birth settings. A doula is a person who supports a pregnant person during pregnancy, birth, and/or postpartum. A doula is not a medical professional and doesn't diagnose or perform medical procedures. Instead, they provide information, comfort, and non-judgmental support to you and your partner/labor team as you make choices or begin to experience new sensations in late pregnancy and during birth. A postpartum doula helps you transition to your new normal by helping you with breastfeeding, establishing a new sleep routine, and doing light chores around the house. Read more about doulas here! Many doulas operate differently. At Birthing Confidence, you can expect 1-2 prenatal visits where I come to your home, and we discuss any concerns you have, try and help your baby move into an ideal position for birth, help you relax, and answer any questions your labor team has. I also give your partner access to an online Labor Support course. During your birth, I usually am in contact with you over text or phone up until you are in active labor or are to a point you feel you cannot manage your contractions without additional support. At that time, I come to your home or meet you at the hospital. I help make sure your birth plan has been communicated to your care providers and inform you about what to expect from your care providers at different times. I provide light touch, massage, reassuring statements, suggestions for comfort and position, and guide your partner in the ways they can best support you. After your birth, I stay for an hour or two to make sure you are comfortable, help you establish early breastfeeding, and get you all something to eat and drink. I visit you once or twice within the first week or two postpartum to see how you are coping with both the physical and emotional changes of parenting. I answer any questions about breastfeeding, newborn behavior, and we also spend time going over your birth and processing your feelings. I do! I offer discounts for public school teachers, EMS frontline personnel, and military service members. I also have early bird discounts and run specials all the time! Make sure to sign up for our newsletter to receive these coupons! If you need a low-cost option, please contact me and we can work out a payment plan or customize a package that could be more inline with your budget. Why choose an independent doula? It really comes down to personal preference. I believe that who you choose to have in your birth room is a very important decision and you should be comfortable with me and know you are getting me or a back up you have met and have approved of. You may find that person at an agency or you may find it through me. I can also be a lot more flexible on pricing, my hours, and terms since I own my own business and services. Lastly, I am not juggling so many clients that I lose my personal touch with you. If you want a doula who is always thinking about you, your needs, and is attentive to your specific situation, an independent doula, like myself, may be the way to go!